How fast are the Amish growing? It has been estimated that at recent rates of growth, the Amish population doubles once every 18-20 years. One reason the Amish population grows so quickly is the large family size among Amish. The average number of children per Amish family can vary by settlement and affiliation. Additionally, high numbers of Amish youth choose to be baptized in the Amish faith, with the majority of baptized Amish remaining with the church. The baptism rate can vary across individual Amish affiliations as well. New Order Amish tend to have among the lowest rates of baptism, with roughly 2/3 of their youth choosing the Amish way of life. In contrast, conservative groups such as the Andy Weaver Amish have very high rates of baptism, in some cases exceeding 90 and even 95%. The high baptism rate is a key factor in the high Amish growth rate, as the number of converts to the Amish is minimal. Additionally, most Amish, once baptized, choose to remain Amish. There are likely a variety of reasons for this. One reason is that an individual who is born into and grows up in the Amish culture is steeped in Amish ways, beliefs, and values. 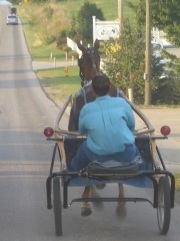 For most in the community, this makes the choice to lead an adult life as a member of the Amish church a natural fit. As Amish only marry other Amish, and since divorce is not sanctioned by the Amish church, marriage to another church member is another motivation to remain within the community. A desire to provide the best life possible for one’s children—and more importantly, best chance to reach the afterlife—also undoubtedly factors into the decision of some Amish to remain within the church. An otherwise fairly progressive Ohio Amish minister, for example, cited this as a prime reason that he did not opt for membership in a “higher” Mennonite church. Additionally, a key factor in Amish retention is played by the Ordnung (church guidelines) and the practice of social shunning. The Ordnung has been likened to a fence which keeps members in and worldly influences out. In The Riddle of Amish Culture, Donald Kraybill quotes an Amishman with the somewhat cynical view that “If it weren’t for shunning, many of our people would leave for more progressive churches where they could have electricity and cars” (Riddle, Kraybill p140). Certain factors have challenged Amish population growth. One is the challenge of making a living. 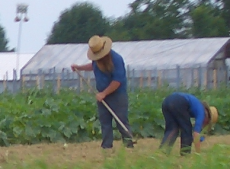 As Amish have historically farmed, a lack of affordable farmland has presented problems for Amish. Some Amish settlements have allowed greater levels of technology as a result, allowing farmers to receive higher yields for milk through use of cooling tanks, for example, or allowing technologies that enable small at-home enterprises, such as furniture shops. These adjustments have provided numerous Amish a way of making a living as a member of an Amish church, while preserving restrictions on education and more widespread use of technology in other domains. Without such adjustments, and with a more rigid approach to technology, more Amish might be motivated to leave the church or simply opt out of Amish baptism in the face of economic realities. Another factor challenging Amish growth rates is a slightly declining birth rate in some settlements. Ironically this may be a tangential result of greater acceptance of technology and an increasing orientation to entrepreneurship. As a more rational worldview is required when operating a business, and contact with the non-Amish public increases, Amish may be exposed to more progressive ideas regarding birth control and may be more likely to adopt means of family planning. At the same time, the drop in births has been relatively small, and robust family sizes remain typical among Amish families. The Amish population has increased from roughly 5,000 at the turn of the 20th century, to a quarter-million today, a pace of growth likely to continue. Amish Online Encyclopedia: Where do the Amish live? 1 responses to How fast are the Amish growing? Leave a reply to How fast are the Amish growing?